It's summer, which means it's holiday time for many people, Shawn and Radio NL 610 AM Morning Show co-host Howie Reimer among them. So where does that leave The Basement's weekly segment? In the capable hands of Jason and Morning Show co-host Shane Woodford of course! That's right, the show always goes on, and Jason and Shane welcome The Basement's first interview in a while as filmmakers Troy Foreman and Jason Morris come on the show to discuss their upcoming documentary Millennium After the Millennium. Millennium After the Millennium takes a look at Chris Carter's highly influential 90s TV series, and why it's still relevant today. Look for the full interview when an extended cut of this episode drops on Sunday morning. 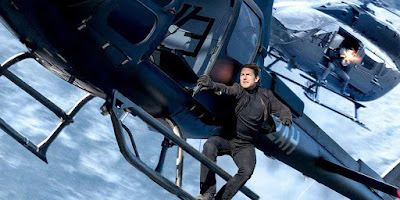 Jason and Shane also run down what to catch in theatres this weekend, including the highly anticipated action-sequel Mission: Impossible - Fallout and the animated spinoff Teen Titans Go! To the Movies. All the fun starts at about 8:40 a.m., and you can hear it on the AM dial or by following the Radio NL link on our website. Don't forget to follow the tweets at @CameTheBasement.